To help achieve this, a MOOC sponsored by the World Bank (Turn Down the Heat) requires students to produce “digital artefacts” with the aim “create a sense of urgency and a call to action for individuals, companies or countries to change behaviors associated with a warming planet”. My call is for the World Bank to change its behaviour and “turn down the hype”. It should be obvious that none of the measures advocated by the World Bank have had much impact on the planet warming, and there is no reason to expect that creating a sense of urgency in support of more of the same will have a better result. The IPCC's authoritative report on Mitigation of Climate Change(2) shows clearly that there is no realistic prospect of holding warming below 2°C. The simple reality is that most emissions will result from the rapid industrialization of developing countries like India and China who cannot and will not switch from the cheapest energy sources available while they remain poor. No amount of hype will change that reality. If the problem was as grave and urgent as claimed there would be no alternative but for developed nations who can afford the cost to switch from cheaper fossil fuels to more expensive nuclear power and also pay the costs of the entire world doing the same. But the World Bank does not advocate that, so it is difficult to believe it takes its own hype seriously. Wind and solar power cannot solve the problem because they are intermittant. Power is also needed when the wind is not blowing and the sun is not shining. There is no technology on the horizon that could store energy cheaply enough to compete with the dispatchable power from fossil fuels, even if wind and solar power was free. Instead of pretending that wind and solar could do the job it is clearly necessary to act differently. Since there is no viable replacement for fossil fuels on the horizon that developing countries could afford, it is necessary to do something very different from what the World Bank advocates. We will need some breakthroughs in fundamental technology. Neither the regulatory nor the market pricing mechanisms advocated by the World Bank can achieve that. Massive investments in research and development and fundamental science are required. Contrary to the hype there is no “return” on that investment. As with all fundamental science, the results have to be made freely available to the countries that are too poor to pay for it. So the “free rider” problem ensures that no carbon pricing mechanism could motivate such investment. At present each developed country is hoping that somebody else will pay to develop the necessary technology. There is no “national” benefit in doing so. It is a global, not a national problem. The most ambitious national targets for R&D are about 3% of GDP for all purposes. These targets are not being met, despite the fact that new technology is the driving force for economic growth. A global levy on developed countries that can afford it is required, to pay for the costs of a massive global R&D program that is not expected to produce any “return” on the investment, other than “merely” solving the problem of global warming. That may require a significant expansion in the total scientific workforce and consequently a long lead time for education. If it is not successful, then we will have to resort to some combination of geo-engineering, adaptation strategies and subsidizing nuclear power in all countries, at potentially vastly greater costs. But even if a massive global R&D program failed to produce clean energy competitive with fossil fuels, it would at least accelerate economic growth generally and enable the whole world to afford more expensive energy than fossil fuels more quickly. We need more modern technology, not medieval windmills. I watched Remote Hope on 4 Corners. In some respects it was quite a good expose about how bad things have become but it still didn't drill down deep enough into the fundamental basis of the problem or interview those who have thought deeply about it and grappled with a solution. Tony Abbott ("lifestyle choices") and Colin Barnett ("put yourself in my shoes") have both shot themselves in the foot and are easy targets. But what is needed is not a free kick of unpopular politicians but an honest description of the problem and some deep thought about a solution. Some good people have thought deeply about the issue of remote indigenous community dysfunction: Peter Sutton, Noel Pearson, Marcia Langton, Bess Price and Stephanie Jarret, to name a few. They are the whistle blowers and they blew the whistle a long time ago. Noel Pearson's essay Our Right to Take Responsibility was delivered in 2000. Why didn't the ABC interview these people? I thought Tammy Solonec of Amnesty International was terrible, talking about human rights in the abstract, not based on any analysis of reality. The best attempt at a solution so far is that proposed by Noel Pearson and his Family Responsibility Commission. See the article by Catherine Ford about that, Great Expectations: Inside Noel Pearson's social experiment. Admittedly nothing about this issue is going to easy. But the problem came about due to bad policy that superficially looked like humane policy. Equal wages led to indigenous unemployment. Welfare led to alcohol and drug abuse and child abuse. The bad policy has dragged on for many years after it was pointed out. Nevertheless, bad policy can be corrected. Of course, it is too late for many but correction of bad policy offers real hope which can grow over time for some. Kerry O'Brien said right at the end that there was no easy solution but still the puzzle is why they didn't put Noel Pearson on who has come up with a hard solution. I think the ABC is more interested in easy hits on Abbott and Barnett than proposing a real solution. See my earlier article, The closure of remote indigenous communities, for links to the ideas of Marcia Langton and Stephanie Jarret on this issue. I wonder how many of those protesters have informed themselves of what really happens in those remote communities --> murder, violence, abuse of women and children, under age marriage etc. in far greater proportions than any where else in Australia. 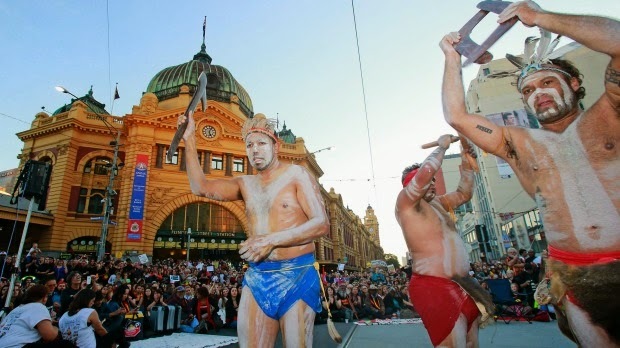 The organising group has called itself Warriors of the Aboriginal Resistance (WAR). Their manifesto is separatist and calls for restoration of tribal sovereignty and customary law. This would perpetuate what is already unacceptable to our post Enlightenment moral values. Gary Clark has written a reply to a criticism of Stephanie Jarret's book, Speaking Out on Aboriginal Violence in the Quadrant, September 2014. Gary's articles can be accessed through academia, here. You will need to logon there.